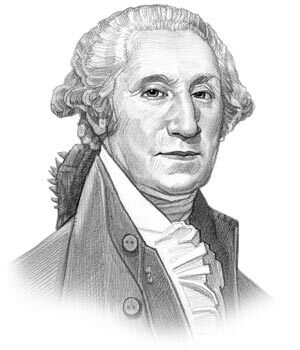 George Washington was the 1st American President who served in office from April 30, 1789 to March 4, 1797. One of the key events of his presidency was the adoption of the Bill of Rights which consisted of the first 10 Amendments to the US Constitution. The Bill of Rights Amendments 1-10 were ratified in 1791. Definition: The First 10 Amendments to the United States Constitution are also known as the US Bill of Rights. An amendment is a change or addition to the US Constitution. The first 10 amendments (the Bill of Rights) were ratified in 1791. The US Constitution allows for additional amendments to be added to the Constitution. This article provides a simplified description of the Bill of Rights Amendments 1-10 with the original text and a simple summary, definition and meaning of the all the Amendments. The Bill of Rights Amendments 1-10 limited the power of the national government and guaranteed US citizens certain personal rights. Simple, but comprehensive summaries of the Bill of Rights Amendments can be accessed via the links in this article. 1 of 10: Congress shall make no law respecting an establishment of religion, or prohibiting the free exercise thereof; or abridging the freedom of speech, or of the press; or the right of the people peaceably to assemble, and to petition the Government for a redress of grievances. Summary of Bill of Rights Amendments: The first of the additions to the original Constitution documents the right to freedom of religion and choice of worship, the right to have freedom of speech, the right of people to be informed by the freedom of the press, the freedom to meet in groups to exchange ideas and opinions and the freedom to request the government to make right any injustices. 2 of 10: A well regulated Militia, being necessary to the security of a free State, the right of the people to keep and bear Arms, shall not be infringed. Summary of Bill of Rights Amendments: The second of the additions to the original Constitution states that people have the right to keep a weapon and to use it to protect themselves. 3 of 10: No Soldier shall, in time of peace be quartered in any house, without the consent of the Owner, nor in time of war, but in a manner to be prescribed by law. Summary of Bill of Rights Amendments: The third of the additions to the original Constitution is a reference to the hated Quartering Acts imposed by the British and states that soldiers cannot take, or live, in a person's house without the permission of the owner. 4 of 10: The right of the people to be secure in their persons, houses, papers, and effects, against unreasonable searches and seizures, shall not be violated, and no Warrants shall issue, but upon probable cause, supported by Oath or affirmation, and particularly describing the place to be searched, and the persons or things to be seized. Summary of Bill of Rights Amendments: The fourth of the additions to the original Constitution is a reference to the Writs of Assistance (Search Warrants) exercised by the British and states that the government cannot arrest a person, or search their property, unless there is "probable cause" that a crime has been committed. 5 of 10: No person shall be held to answer for a capital, or otherwise infamous crime, unless on a presentment or indictment of a Grand Jury, except in cases arising in the land or naval forces, or in the Militia, when in actual service in time of War or public danger; nor shall any person be subject for the same offense to be twice put in jeopardy of life or limb; nor shall be compelled in any criminal case to be a witness against himself, nor be deprived of life, liberty, or property, without due process of law; nor shall private property be taken for public use, without just compensation. Summary of Bill of Rights Amendments: The fifth of the additions to the original Constitution states that the Federal government must follow the due process of the law before punishing a person and that all citizens had the right to a trial by jury. It also states that a person cannot be put on trial twice for the same crime (the Double Jeopardy Clause) or that person on trial for a crime does not have to testify against themselves in court, known as "Pleading the 5th". The provisions of the amendment were extended in 1966 to include the reading of rights - the Miranda Rights. 6 of 10: In all criminal prosecutions, the accused shall enjoy the right to a speedy and public trial, by an impartial jury of the State and district wherein the crime shall have been committed, which district shall have been previously ascertained by law, and to be informed of the nature and cause of the accusation; to be confronted with the witnesses against him; to have compulsory process for obtaining witnesses in his favor, and to have the Assistance of Counsel for his defence. Summary of Bill of Rights Amendments: The sixth of the additions to the original Constitution states that a person has the right to be told what crimes they are charged with, have a speedy and fair trial by a jury, to have a lawyer during the trial and the right to question witnesses against them and have the right to get their own witnesses to testify for them. 7 of 10: In Suits at common law, where the value in controversy shall exceed twenty dollars, the right of trial by jury shall be preserved, and no fact tried by a jury, shall be otherwise re-examined in any Court of the United States, than according to the rules of the common law. Summary of Bill of Rights Amendments: The seventh of the additions to the original Constitution refers to the rights of those being sued and states that a person also has the right to a jury trial for civil cases. 8 of 10: Excessive bail shall not be required, nor excessive fines imposed, nor cruel and unusual punishments inflicted. Summary of Bill of Rights Amendments: The eighth of the additions to the original Constitution says that the government cannot demand excessive bail, excessive fines, or inflict any cruel and unusual punishment. 9 of 10: The enumeration in the Constitution, of certain rights, shall not be construed to deny or disparage others retained by the people. Summary of Bill of Rights Amendments: The ninth of the additions to the original Constitution states that the Constitution does not include all of the rights of the people and the states. It provides reassurance that rights not listed could not be taken away and that the adoption of Constitution itself, and its construction, would limit the powers of government. 10 of 10: The powers not delegated to the United States by the Constitution, nor prohibited by it to the States, are reserved to the States respectively, or to the people. Summary of Bill of Rights Amendments: The tenth of the additions to the original Constitution states that any powers that the Constitution does not give to the government, belong to the states and the people, excluding the powers that the Constitution says the states cannot have. The article on the Bill of Rights Amendments 1-10 provides a summary of one of the major historical documents produced during his presidential term in office. The following video will give you additional important facts and dates about the political events experienced by the 1st American President whose presidency spanned from April 30, 1789 to March 4, 1797.